(1) S'rî S'uka said: 'At the time the incarnation of Lord Vishnu, who is directly the enjoyer of all sacrifices, took His second step [as Lord Vâmana, see 2.7: 17], He with the nail of the big toe of His left foot pierced the upper covering of the universe. The flow of water that from the outside entered the hole, having turned pink from washing away the red powder of His lotus feet, vanquishes the sins of all the world getting in touch with it. It fell, after a very long time ['a thousand millennia'], from the sky down on top of the highest planetary world [Dhruvaloka], that one calls the refuge of Vishnu. Emanating directly from the Supreme Lord's feet it is described as completely pure and has for that reason been given that name [the Ganges as the Vishnupadî]. (2) There, in that place, our most exalted, firmly determined devotee, the famous son [Dhruva, see 4: 8] of Uttânapâda, bathes in the water of the lotus feet of the family deity. With his heart deeply immersed in an intense eagerness, his spontaneous devotional service to the Lord constantly increases and tears are showing in his two flowerlike, slightly opened eyes as a symptom of the ecstasy in his body. Even today he with great reverence accepts upon his head the emanated water that is free from impurities. (3) After him [the waters reach] the seven sages [Marîci, Vasishthha, Atri and so on, see 3.12: 22]. They, well known with this blessing, even at the present moment carry it on their matted hair with great honor. They consider it the ultimate perfection of all austerities to be of such a great and continuous devotional service in bhakti-yoga unto the Supreme All-pervading Lord Vâsudeva. While other people seek and find a different form of [nirvis'esha-vâdi or impersonal] liberation, they reach their goal by neglecting all other means of attaining perfection [as by economic development, the regulation of sense gratification, or by religion]. (4) When the water, in its fall in the realm of the gods, has inundated the sphere of the moon that is so congested by the thousands and millions of their different vimânas [divine palaces, different points of view or heavenly vehicles], it next falls down upon the abode of Brahmâ. (5) There it divides into four branches carrying the names of Sîtâ, Alakanandâ, Cakshu and Bhadrâ, that flow away in the four directions towards the great reservoir, the ocean. (6) The Sîtâ originating from the city of Brahmâ, flows downwards from the tops of the Kesarâcala and of other great mountains. Fallen on the top of the Gandhamâdana mountain within the province of Bhadrâs'va going in the western direction it enters into the salty ocean. (7) The same way coming down from the top of the mountain Mâlyavân, the water of the [branch of the Ganges called the] Cakshu next flows uninterrupted in the direction of Ketumâla to enter the ocean in the west. (8) The Bhadrâ, coming down from Mount Meru, flows from one mountain peak to the other [the Kumuda and the Nîla] and falls down from Mount S'ringavân to go in the northern direction through the entire area of Kuru and finally enters the ocean in the north. (9) Similarly the Alakanandâ [branch of the Ganges], flowing down at the southern side of Brahmapurî [Mount Meru], passes many mountain tops to reach, more fiercely, with a greater force Hemakûtha and Himakûtha to cut [thereafter] through Bhârata-varsha in the direction of the ocean in the south. For someone on his way to bathe in the water it is, with every step he makes, less difficult to obtain the result of great sacrifices like the As'vamedha and the Râjasûya. (10) The many hundreds of other rivers and streams that run through each of the many tracts of land, all should be considered daughters of Mount Meru. (11) Of all these [nine] varshas the land known as Bhârata-varsha [India] constitutes the field [kshetra] of karma [of shaping one's destiny by actions]. The remaining other eight varshas are the heavenly places here on earth where, so the scholars say, those who were promoted to heaven, may spend the remaining merit of their virtuous deeds. (12) For thousands of years they in these lands all enjoy their lives just like gods, with bodies like thunderbolts that are as strong as a thousand elephants. Youthful and excited about a great deal of sexual pleasure and other sensual delights in diverse relationships, they at the end of their term of [liberal] mating then conceive a single child. They know times of harmonious living there like one had during Tretâ-yuga [the period that mankind lived in piety]. (13) In each of those lands the godlike leaders because of their virtuous conduct never run short of respect and offerings. During all seasons they have lots of flowers as also fruits because of which the branches of the trees heavily bend down. The gardens to their many divine refuges are full of beautiful trees and creepers. There are many lakes of crystal clear water in the valleys of the mountain ranges that demarcate their lands. In those lakes one finds all kinds of fragrant fresh lilies with humming bumblebees, eager great swans, ducks, cranes and other aquatic birds. They enjoy all kinds of water sports there and lustily court the attractive godlike women who, smiling with their playful glances, entertain themselves freely with great joy, an eager look and an enchanted mind. (14) The Supreme Lord Narâyâna, the great personality, certainly proves His mercy to His devotees in all these nine varshas by personally promoting the reality of the soul [through his four appearances as Vâsudeva, Sankarshana, Pradyumna and Aniruddha, see 4.24: 35-36]. Up to the present day He thus stays near his devotees to accept their service (*). Third revised edition, loaded May 27, 2018. S'rî S'uka said: 'At the time the incarnation of Lord Vishnu, who is directly the enjoyer of all sacrifices, took His second step [as Lord Vâmana, see 2.7: 17], He with the nail of the big toe of His left foot pierced the upper covering of the universe. The flow of water that from the outside entered the hole, having turned pink from washing away the red powder of His lotus feet, vanquishes the sins of all the world getting in touch with it. It fell, after a very long time ['a thousand millennia'], from the sky down on top of the highest planetary world [Dhruvaloka], that one calls the refuge of Vishnu. Emanating directly from the Supreme Lord's feet it is described as completely pure and has for that reason been given that name [the Ganges as the Vishnupadî]. There, in that place, our most exalted, firmly determined devotee, the famous son [Dhruva, see 4: 8] of Uttânapâda, bathes in the water of the lotus feet of the family deity. With his heart deeply immersed in an intense eagerness, his spontaneous devotional service to the Lord constantly increases and tears are showing in his two flowerlike, slightly opened eyes as a symptom of the ecstasy in his body. Even today he with great reverence accepts upon his head the emanated water that is free from impurities. After him [the waters reach] the seven sages [Marîci, Vasishthha, Atri and so on, see 3.12: 22]. They, well known with this blessing, even at the present moment carry it on their matted hair with great honor. They consider it the ultimate perfection of all austerities to be of such a great and continuous devotional service in bhakti-yoga unto the Supreme All-pervading Lord Vâsudeva. While other people seek and find a different form of [nirvis'esha-vâdi or impersonal] liberation, they reach their goal by neglecting all other means of attaining perfection [as by economic development, the regulation of sense gratification, or by religion]. When the water, in its fall in the realm of the gods, has inundated the sphere of the moon that is so congested by the thousands and millions of their different vimânas [divine palaces, different points of view or heavenly vehicles], it next falls down upon the abode of Brahmâ. There it divides into four branches carrying the names of Sîtâ, Alakanandâ, Cakshu and Bhadrâ, that flow away in the four directions towards the great reservoir, the ocean. The Sîtâ originating from the city of Brahmâ, flows downwards from the tops of the Kesarâcala and of other great mountains. Fallen on the top of the Gandhamâdana mountain within the province of Bhadrâs'va going in the western direction it enters into the salty ocean. The same way coming down from the top of the mountain Mâlyavân, the water of the [branch of the Ganges called the] Cakshu next flows uninterrupted in the direction of Ketumâla to enter the ocean in the west. 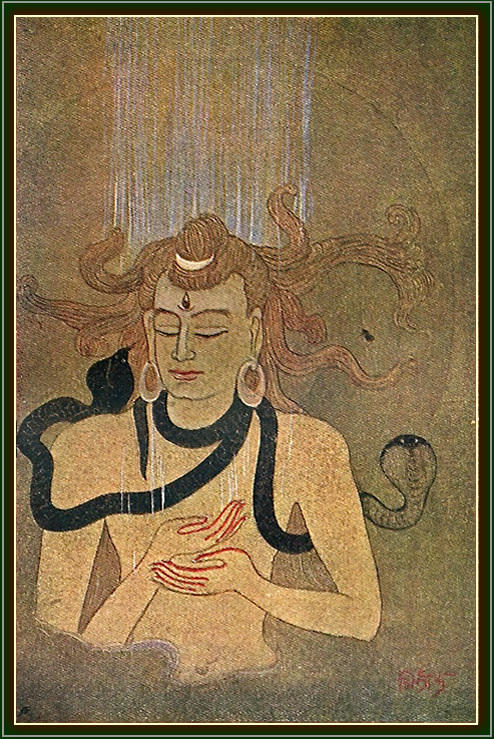 The Bhadrâ, coming down from Mount Meru, flows from one mountain peak to the other [the Kumuda and the Nîla] and falls down from Mount S'ringavân to go in the northern direction through the entire area of Kuru and finally enters the ocean in the north. Similarly the Alakanandâ [branch of the Ganges], flowing down at the southern side of Brahmapurî [Mount Meru], passes many mountain tops to reach, more fiercely, with a greater force Hemakûtha and Himakûtha to cut [thereafter] through Bhârata-varsha in the direction of the ocean in the south. For someone on his way to bathe in the water it is, with every step he makes, less difficult to obtain the result of great sacrifices like the As'vamedha and the Râjasûya. The many hundreds of other rivers and streams that run through each of the many tracts of land, all should be considered daughters of Mount Meru. Of all these [nine] varshas the land known as Bhârata-varsha [India] constitutes the field [kshetra] of karma [of shaping one's destiny by actions]. The remaining other eight varshas are the heavenly places here on earth where, so the scholars say, those who were promoted to heaven, may spend the remaining merit of their virtuous deeds. For thousands of years they in these lands all enjoy their lives just like gods, with bodies like thunderbolts that are as strong as a thousand elephants. Youthful and excited about a great deal of sexual pleasure and other sensual delights in diverse relationships, they at the end of their term of [liberal] mating then conceive a single child. They know times of harmonious living there like one had during Tretâ-yuga [the period that mankind lived in piety]. In each of those lands the godlike leaders because of their virtuous conduct never run short of respect and offerings. During all seasons they have lots of flowers as also fruits because of which the branches of the trees heavily bend down. The gardens to their many divine refuges are full of beautiful trees and creepers. There are many lakes of crystal clear water in the valleys of the mountain ranges that demarcate their lands. In those lakes one finds all kinds of fragrant fresh lilies with humming bumblebees, eager great swans, ducks, cranes and other aquatic birds. They enjoy all kinds of water sports there and lustily court the attractive godlike women who, smiling with their playful glances, entertain themselves freely with great joy, an eager look and an enchanted mind. The Supreme Lord Narâyâna, the great personality, certainly proves His mercy to His devotees in all these nine varshas by personally promoting the reality of the soul [through his four appearances as Vâsudeva, Sankarshana, Pradyumna and Aniruddha, see 4.24: 35-36]. Up to the present day He thus stays near his devotees to accept their service (*). In Ilâvrita-varsha the Supreme Lord S'iva is the only man. Any man other than him who wants to enter that most excellent realm, will find out what leads to the curse of Bhavânî [His wife] and make him turn into a woman. I will dilate on that subject later on [see 9.1]. In the company of Bhavânî there are ten billion women who always serve the in four expanded Supreme Lord [zie 1.5: 37]. The fourth expansion of the Supreme Personality, known as Sankarshana, constitutes the source of His form in the mode of ignorance. Lord S'iva, in trance meditating on Him, calls Him into his heart by reciting the following in worship. The powerful Lordship says: 'My obeisances unto You, oh Supreme Lord, oh greatest Original Personality and reservoir of all transcendental qualities, oh You whom I revere as the one unlimited and unseen within this world. Oh worshipable one whose feet ward off all danger, You, to whom we owe all the different opulences, are the very best, the ultimate shelter invaluable to the devotees to whose satisfaction You manifest Yourself in different forms. I sing Your glory because You put an end to the repetition of birth and death, oh You, Supreme Controller and source of this creation. Who of us not in control of the force of his anger, would, aspiring to conquer his senses with the command of Your glance, not be of worship unto You? Your vision is never, not even to the slightest degree, clouded by the restless mind that one has because of the qualities of the deluding material world. To a person with an impure vision You with Your bloodshot eyes appear as someone who under the influence of mâyâ is inebriated because of drinking too much honey sweet liquor. But [such a person is as impure as e.g.] the wives of that serpent demon [Kâliya, see 10.16] who could not worship You anymore because of their bashfulness about being sensually aroused from touching Your feet. By You, so say all the sages, the world is maintained, created and annihilated, while You Yourself are free from these three [basic qualities]. To You as the Unlimited One, the universes situated on the hundreds and thousands of Your hoods, weigh not more than a mustard seed. From You the first embodiment of the gunas originated: the most powerful one who was never born [Lord Brahmâ], the reservoir of all wisdom and cosmic intelligence of the total energy of the universe. From him I [Rudra] appeared in this world who, endowed with the three basic qualities, from my material [ahankâra ego] potency give shape to the demigods, the [five] material elements and the senses. Being controlled by You, we - the great personalities, I, the demigods, the five elements and the total energy - are bound to You like birds on a string and all together form this material world by Your grace. *: In some of the sâtvata-tantras, one finds a description of the nine varshas in terms of the predominating Godhead worshiped in each of them: (1) Vâsudeva, (2) Sankarshana, (3) Pradyumna, (4) Aniruddha, (5) Narâyâna, (6) Nrisimha, (7) Hayagrîva, (8) Mahâvarâha, and (9) Brahmâ. The picture is titled: 'The Birth of Gangâ', and is painted byKhitindra Nâth Mazumdar.